We would like to expose those of you reading this blog to a way of helping some deserving children to a better education for their future and a more balanced daily nutrition for a growth of body and mind . 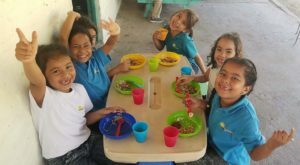 Escuela Adelante provides high quality, alternative education in Spanish and English to meet the diverse needs of San Juan del Sur, Nicaragua. We offer bilingual preschool, several levels of STEM-based ESL and bilingual coursework for elementary-aged students, and adult ESL classes. All of our programming is founded in our core concepts of Accessibility, Diversity, and Academic Excellence. We have been serving the community since 2014 and plan to expand to full-time bilingual primary and secondary school, including technical training, college preparation, and extracurricular academic courses. Escuela Adelante does not have adequate space to cook and serve nutritious lunches to its expanding student body. We plan to add a grade each year and we barely have enough seating space for our current program at lunchtime. The beautiful open-air, thatched roof cafeteria will facilitate healthy, comfortable and efficient lunch experiences for the classes, and will double as a community space for meetings and events. The large kitchen will allow staff to produce enough food for all the students. It will also serve as a learning kitchen, where children and adults will benefit from cooking classes that utilize healthy ingredients harvested on-site. Please click here for the Adelante school website.